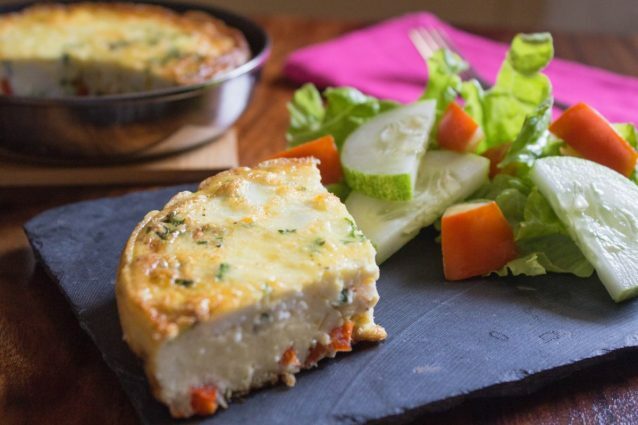 Vegetable frittata: a colorful egg preparation with vegetables! 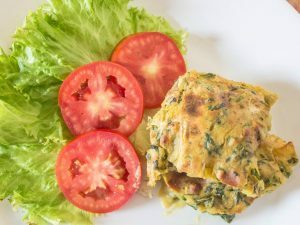 Vegetable frittata is a truly delicious egg preparation that you may eat as such to enjoy a superbly healthy breakfast meal. You may refrigerate the left over frittata in an air tight container and use it for the following day to ease out your breakfast worries. Instead of restricting yourself to the vegetable choices mentioned in this recipe, you may add other vegetables of your choice such as spinach, mushroom, capsicum, and broccoli. Crack open the eggs in to a large bowl and then beat them with milk, salt, and black pepper powder until the mixture is frothy. Heat an oven safe pan and add olive oil to it. Sauté the chopped red bell pepper and onion in the hot oil and cook until the onion is soft. Evenly spread the vegetable mixture in the pan and pour the egg mixture over it. Sprinkle the finely chopped parsley evenly over the egg mixture and let the egg cook on low flame. After about 30 seconds, evenly spread the crumbled feta all over the frittata. Preheat the oven to 175 degrees C.
Cover and cook the eggs on low flame without stirring the egg mixture until the eggs begin to set around the edges. Transfer the frittata, while it is still inside the cooking pan, to the preheated oven and bake the frittata for about 10 minutes or until it is almost set at the center and golden brown on top. Slice, serve and enjoy the frittata. Make sure you move your hands in only one direction while you whisk or beat the ingredients. In case you use hand blender/whisk, again make sure that the gadget moves in one circular direction only. Be extra careful around the final minutes of baking so that the frittata does not come out charred. Make sure that you carefully remove the egg shells while you break the egg. A wiser technique would be to break the egg in a separate bowl first and then use that broken egg for the recipe.